Check-in open 1 p.m. to 6 p.m. in the San Cristobal Foyer. NASS office is open Noon to 6 p.m. in Conference #10. July 14 Saturday 6 p.m.
July 15 Sunday 8 a.m. – 9 a.m. Reception and Dinner – La Fortaleza. 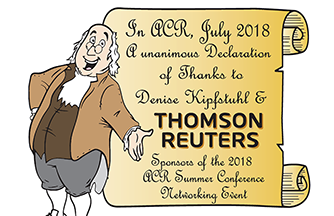 Buses depart at 6:30 p.m.
July 16 Monday 8 a.m. – 9 a.m.
NASS/ACR Lunch – Presentation Beth Colleton, Senor Vice President, Corporate Social Responsibility for NBC Universal. Reception and Dinner Casa Bacardi. Meet in the Lobby. Buses depart at 6:30 p.m.
Monday, July 16, 2012, 4 p.m. – 5 p.m.
Tuesday, July 17, 2012, 4 p.m. – 5 p.m.